How to Specify the Personal templates Path in Microsoft PowerPoint 2013 ? In Microsoft PowerPoint 2013 , you might sometimes save the presentation file in a template format which you might later use it for the new PowerPoint presentation. Microsoft PowerPoint 2013 needs to know where to look out for when finding the personal templates . You can specify the location of the Personal templates by following the steps below. 1. Launch Microsoft PowerPoint 2013 . 2. Navigate to File -> Options. 3. 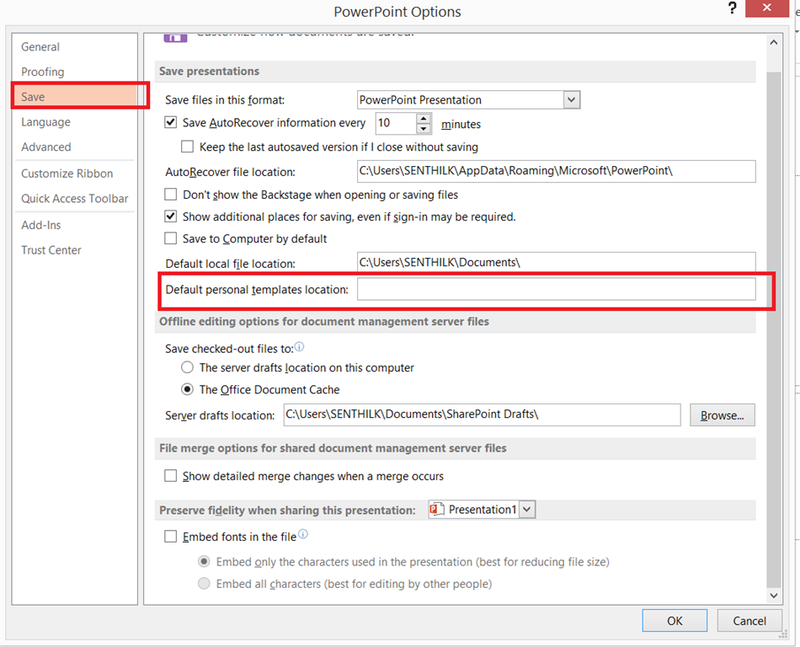 In the PowerPoint Options Dialog , click “Save” link in the left sidebar and then enter the path to the location of the Default Personal template in the “Default personal templates location” textbox.